Florida police are planning to pack a court hearing Monday for a Broward County deputy indicted for killing a man holding an unloaded pellet gun. "We have asked that every deputy that is not working to attend the court hearing to show their support," said Jeff Bell, president of the Broward chapter of the International Union of Police Associations. Deputy Peter Peraza was indicted last week on a charge of manslaughter in the July 2013 death of Jermaine McBean, who was shot while walking home with an air rifle he had just purchased at a pawn shop. Police say McBean, 33, ignored their commands to drop the rifle and pointed it at them before Peraza opened fire. But a witness has told NBC News that McBean did not take the rifle off his shoulders, and a photo taken after he was killed shows he had headphones on — even though police insisted there was no reason he couldn't hear them. Peraza, 37, is the first Broward County law enforcement officer to face criminal charges for fatally shooting a civilian in 168 incidents dating back to 1980. He has pleaded not guilty. 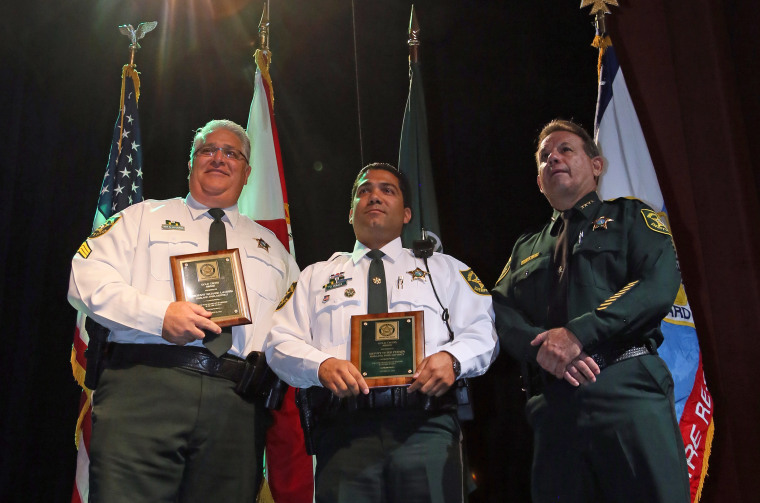 The Broward County sheriff's office — which had given Peraza a bravery award for shooting McBean — suspended him without pay pending the outcome of the trial, angering fellow officers who have launched several fundraising efforts. McBean's death has drawn attention from Broward County's Black Lives Matter coalition. A spokesman for the group said he could not comment on whether members planned to be present at Monday's hearing. He said officers' support for Peraza is "misguided."